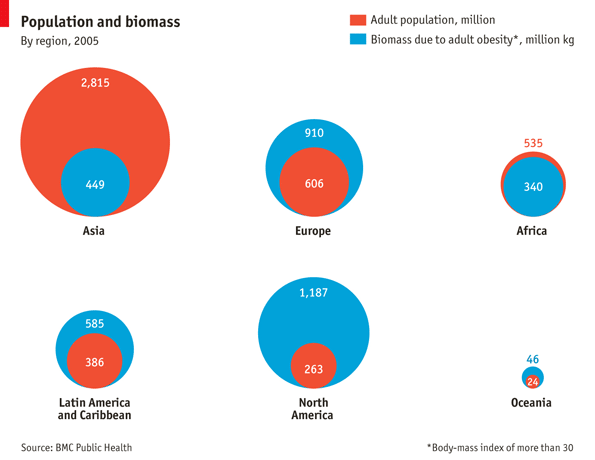 If the whole world had the same proportion of overweight and obese people as America, its biomass would rise by 20%, says the Economist. I am sure you will like this collection of Sunday reads. Indian Dalits' suffering laid bare by photographer. (BBC) Also read how Dalits are still fighting untouchability. What is the Muslim Brotherhood? (CNN) Also check out the brief biography of the U.S.-educated Islamist president of Egypt. A highly diverse set of articles for you. A political farce is playing out in Pakistan, with the principal actors - government, judiciary, and the military - all enacting a tragedy of mammoth proportions. 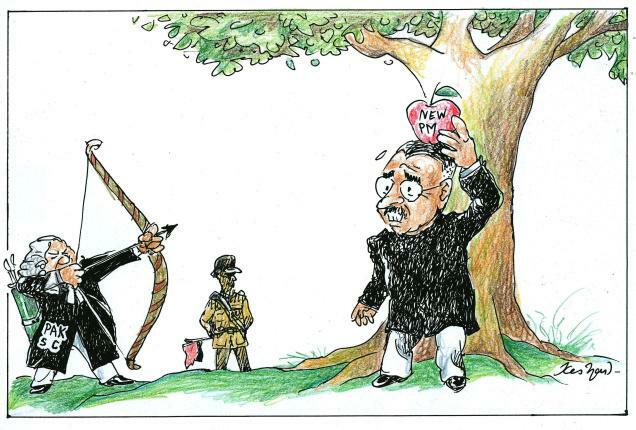 The Hindu captures the executive's dilemma in this brilliant cartoon. This is easily one of the best collection of reads I could gather for your Sunday. 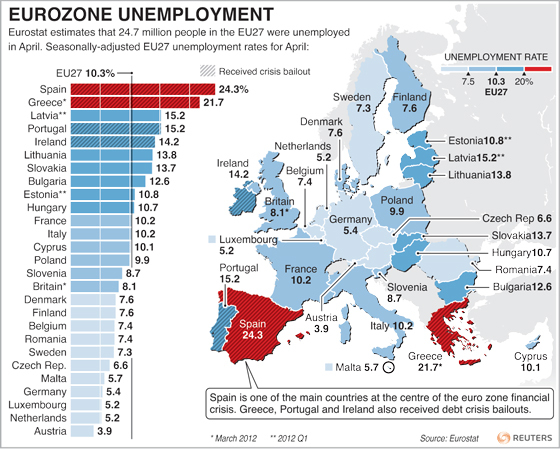 Eurostat estimates that 24.7 million people in the EU27 (27 members of the European Union) were unemployed in April. The Reuters graphic below breaks those numbers out on a country-by-country basis. If each woman had been allowed only one child since 1980, China’s population would have been 340m smaller than it was in 2010. 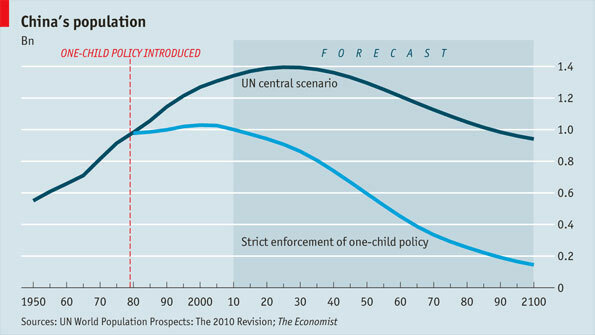 If a strict one-child limit were in force for the rest of this century China’s population would shrink to less than 145m by 2100, 800m fewer than the UN projects in its central scenario. Read more at the Economist. Here is my collection of Mid-Week reads for you. Data have always fascinated me. As an MBA entrance test prep teacher, almost on a daily basis I face questions on various kinds of management programs and the schools that offer them. To give the right advice calls for access to the right kind of data (information, including figures); I believe that only if I have the right data, I can give the right advice, something that will help the MBA aspirant make the right decision. After all the choice of school and program is crucial in helping one acquire learning and skills, both of which are central to realise one’s career goal. 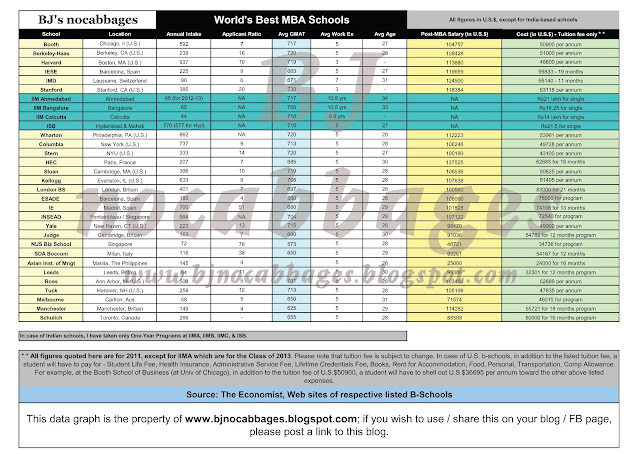 Today, I am going to share a self-made datagraphic on the World’s Best MBA Colleges. 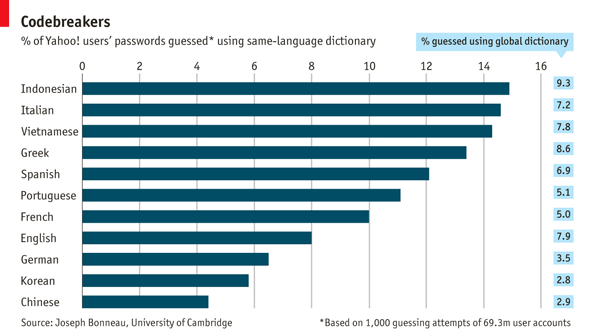 The data sources have been listed; in this datagraphic, you will not find the names in alphabetical order. I have taken the names from The Economist Which MBA listing. However, I have collected all the relevant data from the Websites of the schools. I have not included data on the two-year programs offered by Indian MBA colleges; maybe I will come up with one such datagraphic later. In case you wish to share this datagraphic, please carry the link to this page on your blog/FB/Twitter account. Click on the graphic for a gigantic view. The Internet has changed the way we live. In the last few decades, it has evolved from an esoteric research tool to a great mass-based popular medium of communication (for business, social, and other reasons). 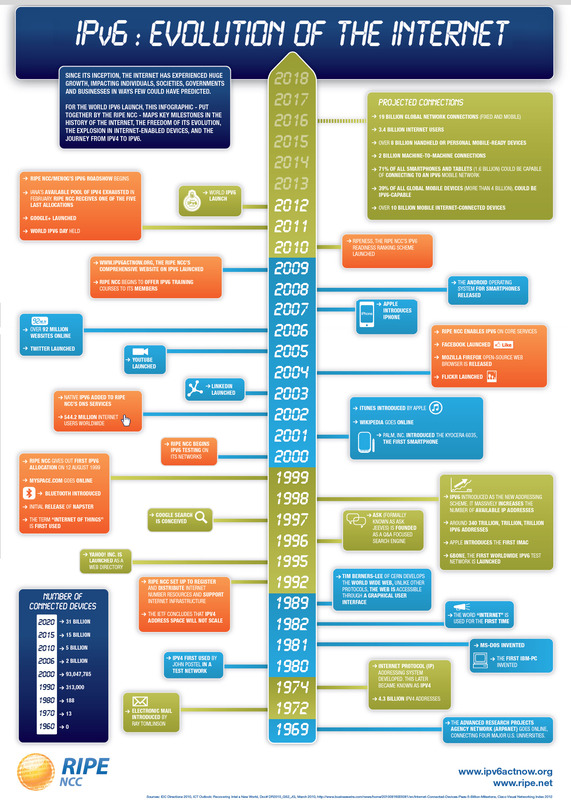 Check this awesome infographic on the evolution of the Internet; sourced from visual.ly. This week's Mid-Week Reads on the Best of Politics, Economics, & Ideas will not be published. This is due to my preoccupation with some professional commitments. However, let me share some good news: this blog has crossed 4 lakh pageviews in just under 13 months. The Rae Bareli seat in Uttar Pradesh has been a Gandhi family bastion since 1967 when Indira Gandhi first stood for election from there. Sonia Gandhi adopted the constituency in 2004 and was re-elected with a huge majority in 2009. It should, therefore, be one of India's most developed districts. Right? Wrong. 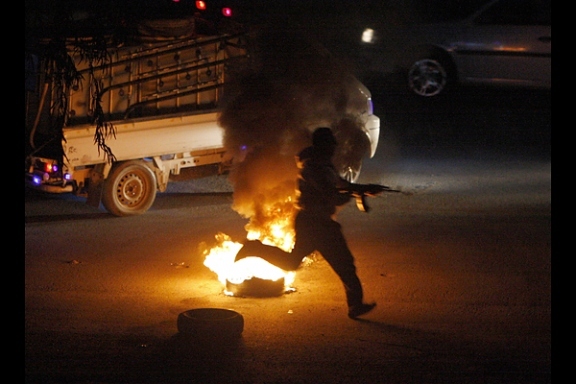 Sunday Slideshow Special: Photos from the War Zone in Syria, from TIME. As a teacher working for a CAT prep institute, students often ask if I could help them with learning vocabulary. Well, I won't claim to be an expert on this issue; there are a number of ways to learn vocab and yes, I too have one! For Vocab, try the Root-Prefix-Suffix (RPS) method. Pick a word, find the RPS related to the chosen word. There are two important books required to acquire a degree of comfort in building vocabulary: (a) dictionary (my favourite is Concise Oxford Dictionary; it carries root of the word, tracing its origin and development) and (b) thesaurus (Roget’s Thesaurus of Synonyms and Antonyms). It is important that you read extensively, on a wide range of issues. This way you will come across known, and also some new, words. The next step involves finding the meaning of these words, esp., new words. As for the known words, refer to a thesaurus... here you can learn related words – both of the same meaning and opposite meanings. The above steps involve pretty little effort; at first glance, this may appear difficult but after a week of such practice, I am sure you will feel comfortable. Write the chosen word in the middle of the page (have a 100 page notebook for this purpose) and circle it. 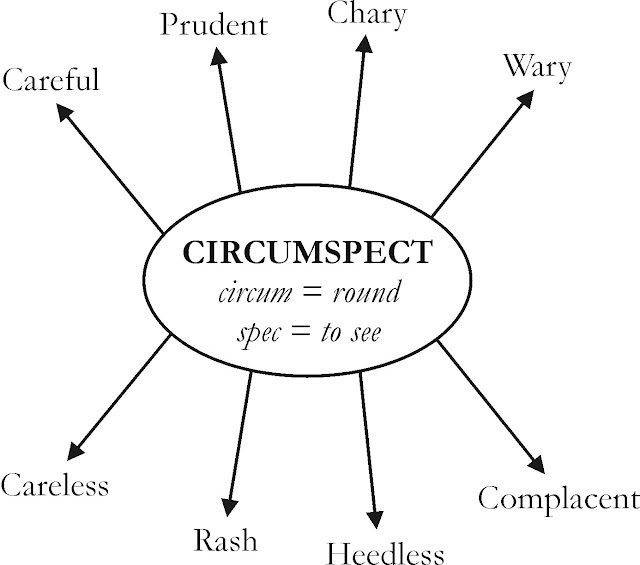 Drag four arrows on the top side and four on the bottom side of the circle; for each arrow on the top, write one synonym of the circled word. Write four such words. Repeat this for the bottom arrows; in this space, write antonyms. For your benefit, find below one such picture I have created. Learn one word daily, with four synonyms and four antonyms (may not be exact synonyms / antonyms but could be related). I think this kind of pictorial method helps in word retention, especially if you look at the picture twice or thrice daily. Yes, it is true that you may forget half of these words but it is unlikely that you will forget all the mentioned words. Start building vocabulary; this will improve comfort level with language, sentence construction, word usage, grammar, and vocabulary. And yes, this will help in knowledge building too. Beyond Black Hawk Down. (Vanity Fair) If you have watched Hollywood top film Black Hawk Down, then you must read this story. 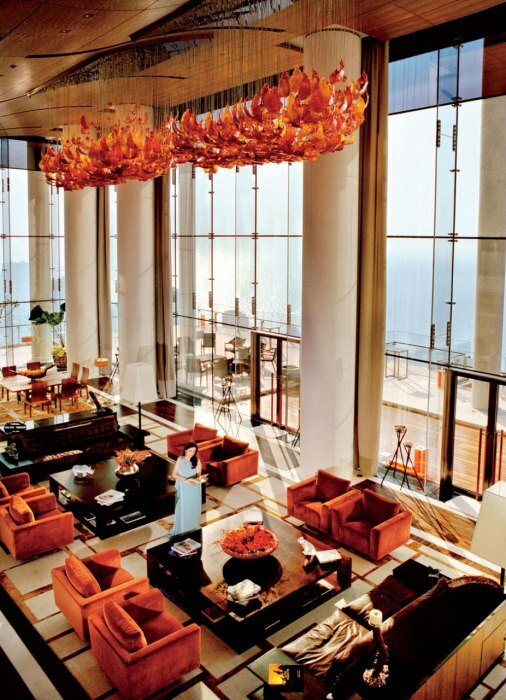 Sunday Slideshow Special: Mukesh Ambani's Antilla, featured in an exclusive (not really) slideshow from the pages of Vanity Fair. Douglas Adams is the author of The Hitchhiker's Guide to the Galaxy. Here's an excerpt from a tribute article published in the Times. I remember him telling me once of something that, he said, had just happened to him at the railway station. He was early for a train, so he bought The Guardian, a cup of coffee and a packet of biscuits, and sat down at a table, putting the folded newspaper down so he could do the crossword. The packet of biscuits was in the middle of the table. The Times link is not working; so I linked this piece to another site, which has a copy. Go read the complete piece here.